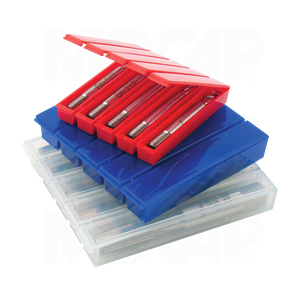 Five compartment Snap-Paks are a handy way to package drills, milling cutters and shank tools and individually dispense them without having to be repacked. Just snap one off for single unit use. Each individual unit incorporates a hinged lid snap closure that can be reused. Perforated plastic labels can be supplied plain or pre-printed to your specifications. Snap-Paks are available in transparent and red Polypropylene (PP). Burr-Paks are available in transparent Polypropylene (PP). 100% recyclable. Additional colours are available.